PROOF IN THE PUDDING--When it comes to blasting apart a diet I can resist anything but temptation. And, my sweet tooth sirens’ song has always been bread pudding! 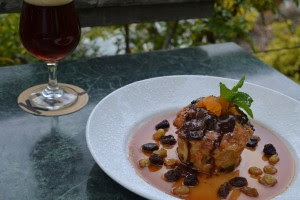 West Coaster, the year old print newszine and web page media effort is about to print in its December issue featuring a Karl Strauss Brewery recipe “Bread Pudding with Drunken Raisins and Caramel Sauce.” Editors are offering us a sneak peek in time for Thanksgiving. Tasty. West Coaster’s holiday issue will be at its usual 200 location distribution points soon after Turkey Day. See West Coaster’s website for map of newsstand sites. Recipe: Karl Strauss Brewery Executive Chef Gunter Emathinger with the brewery’s R&D Coordinator Corey Rapp.